The team responsible for the design, fabrication and manufacture of two separate pumping systems and controls stand behind the finished equipment before it shipped to Alaska’s newest fish hatcheries. In an effort to replenish Alaska’s dwindling fish population, the Alaska Department of Fish and Game is on track to complete two fish hatcheries in Anchorage and Fairbanks. These hatcheries will be capable of producing several species of cold water fish for the stocking of area lakes, ponds and rivers at a cost of $96 million. According to state-run website, Alaska.Gov, the new hatcheries are an integral part of a development strategy by the Sport Fish Division to ensure the continued and increased production of sport fish for the South Central Region and Interior Alaska Region. Each facility will be producing roughly six species of cold water fish: Rainbow Trout, Lake Trout, Arctic Char, Arctic Grayling, Silver Salmon, and King Salmon. Alaska’s official website says that once completed, the 134,000 square ft. Anchorage Sport Fish Hatchery will be the largest enclosed sport fish hatchery in North America. Total production will depend on the desired species mix, release size and timing but full capacity production will allow for a 50% increase over historic stocking levels. Metropolitan Industries was contacted by the Phoenix, Ariz. and Portland, Ore. Offices of HDR One Company to make recommendations for several booster systems for the Anchorage Sport Fish Hatchery. HDR is a global architecture, engineering and consulting firm that has recommended Metropolitan’s equipment in the past. Metropolitan was tasked with offering solutions for water pressure booster systems that would be an integral part of providing and regulating water and filtration systems within the hatchery. In order to avoid harming the fish, the systems would be designed with components that did not contain yellow metals. This improved aquaculture technology reduces the volume of freshwater required to raise the same quantity of fish and the energy required to heat water to an optimum fish-rearing temperature. It also reduces the amount of effluent water discharged from the hatchery. HDR’s Phoenix office was in charge of designing the process water systems. These systems take tempered well water and introduce it to the hatchery’s filtration system and hold it in large reservoirs. Two of the Metropolitan packaged booster systems then take the water out of these reservoirs and “boost” it into the hatchery. The two systems handle the hot (65 -75° F) and cold (55 – 65° F) water. The Hot Water Process System (HWPS) was designed as a triplex booster system that takes incoming well water and discharges it from a basin at the rate of up to 1,930 gallons per minute @ 50.3 feet of total dynamic head (TDH). Each pump is rated for 965 GPM at 50.3’ TDH, 20 hp, 460 volt with the third pump being a back-up. 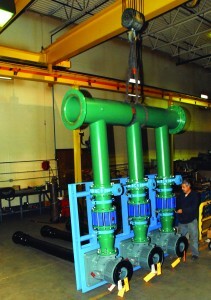 Pictured is a section of pumping equipment that utilizes vertical turbine pumps rated for 1,134 GPM at 51.5’ TDH. The Cold Water Process System (CWPS) was also designed as a triplex system rated up to 2,268 GPM at 51.6’ TDH. Each pump on the CWPS is rated for 1,134 GPM at 51.5’ TDH, 25 HP, 460 volts. With the layout of the basin and control room already in place, the design selected was to use vertical turbine pumps with variable speed controls on this particular system. Both systems required FDA approved fusion bonded epoxy coated fabricated steel piping (in compliance with NSF61) consisting of 10-inch branch and 16-inch headers according to Metropolitan Project Manager Bob Bukowski who coordinated logistics for the project. Bukowski said, given the size of the pumps, pipe work and valves, Metropolitan had to lay the systems out in a split-skid configuration. This method has each system built in two parts making up one complete system skid, which is easily assembled on site and makes handling during installation easier and shipment more practical. HDR’s Portland office was in charge of the Influent Degassed Water System design. The degasser system functions just as the name implies, it removes the gas from the water. The water is then tempered and stored in above ground storage tanks. The layout that HDR already had in place had these holding tanks positioned above the location of the booster systems. Like the process water systems, the influent degassed water systems were designed in two parts: Influent Heater Degassed Water System (IHDWS) and Influent Chilled Degassed Water System (ICDWS). Both are designed in a duplex configuration with one pump being a back-up. The IHDWS is designed for 1,130 GPM at 50’ TDH while the ICDWS is designed for 1,261 GPM at 46’ TDH. Both systems are fitted with 20 hp, 460 volt motors and variable speed controls. As with the process water systems, the piping on the degassed water systems is FDA approved, (NSF61) fusion bonded epoxy coated fabricated steel. All piping and valves on these systems are 10-inch. Due to the space allowed under the holding tanks, it was necessary to design a separate skid for the controls of each system. This allows for the systems to be positioned to line up with the piping of the tanks while putting the controls in an easily accessible area. The construction of the hatchery is being managed by Kiewit, one of North America’s largest construction and mining organizations. Superior Plumbing and Heating, a sub-contractor of Kiewit, has been commissioned for the procurement and installation of the systems. All four systems shipped from Metropolitan in November of 2010. For more information regarding the job, contact Mike Tierney, Metropolitan National Sales Manager, at 815-886-9200, ext 234.